Legendary horror film soundtrack composer Claudio Simonetti and his critically acclaimed band, Claudio Simonetti’s Goblin, have announced a fall North American headlining tour. At the special shows, the group will live score their classic soundtrack to Dario Argento‘s revered 1977 supernatural horror film Suspiria, during a full screening of the film. Due to popular demand, the highly anticipated tour event, which will launch on October 28 in Baltimore, MD, has added tour stops in an additional 16 cities as well as special matinee shows and/or additional performances in Atlanta, Austin, Chicago, New York and Oakland, where the previously-announced shows have sold out in advance. 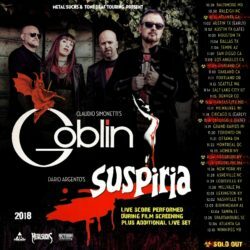 Claudio Simonetti’s Goblin — the keyboardist’s new version of Goblin — will also perform additional time-honored Goblin material at the shows. Described by Rolling Stone as both “iconic” and “horror canon”, the soundtrack to Suspiria has become the genre’s standard bearer and the criterion by which resulting horror film scores have come to be judged. Utilizing experimental instruments atypical of soundtracks at the time – tabla, bouzouki, and Moog synthesizer – Simonetti and Goblin created the movie’s iconic, eerie music-box–like main theme, and additional tense exercises in rhythm, dissonance and bizarre funky prog that NPR has hailed as “chilling” and Entertainment Weekly called “hauntingly spooky”. The main title theme was named as one of the best songs released between 1977–79 in the book The Pitchfork 500: Our Guide to the Greatest Songs from Punk to the Present, compiled by influential music website Pitchfork. With filmmaker Luca Guadagnino set to unleash his much-talked-about film retelling of Suspiria this fall, including a score composed by Radiohead‘s Thom Yorke, there is no better time to revisit the terrifying original motion picture and its shocking soundtrack, performed by its original creators in an intensely intimate setting. Claudio Simonetti (born 19 February 1952, São Paulo) is a Brazilian-born Italian musician and film composer. The keyboardist of the progressive rock band Goblin, Simonetti has specialized in the scores for Italian and American horror films since the 1970s. A long-time collaborator of director Dario Argento, Simonetti has worked on several of the director/producer’s films including Deep Red, Suspiria, Dawn of the Dead, Tenebrae, Phenomena, Demoni, and Opera. His work has long been an iconic staple of Italian genre cinema, collaborating with directors like Ruggero Deodato, Umberto Lenzi, Lucio Fulci, Enzo G. Castellari, Lamberto Bava, and Sergio Martino. Simonetti’s highly experimental scores are known for their signature, electronic and progressive rock-influenced sound, and have been imitated countless times. He studied at the Conservatorio di Santa Cecilia in Rome. Suspiria (pronounced [sʊsˈpɪ.ri.a], lit. Latin: “sighs”) is a 1977 Italian supernatural horror film directed by Dario Argento, co-written by Argento and Daria Nicolodi, partially based on Thomas De Quincey’s 1845 essay Suspiria de Profundis (Sighs from the Depths) and co-produced by Claudio and Salvatore Argento. The film stars Jessica Harper as an American ballet student who transfers to a prestigious dance academy in Germany but realizes, amidst a series of brutal murders, that the academy is a front for a supernatural conspiracy. 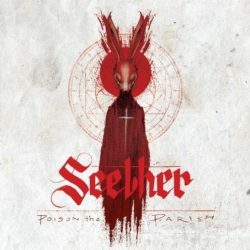 Support acts for the tour include: Letters From the Fire (May 2 through May 27; July 16 through August 20), Through Fire (June 1 through June 7), Kaleido (May 2 through June 10), and Big Story (from July 16 through August 20). 10 Years Release Video For The Song “Novacaine”. With praise still reverberating from December’s unveiling of “Governed By Contagions,” At The Drive In has issued another clarion call from its first album in 17 years: “Incurably Innocent” is the second track to be released in advance of that record, titled in • ter a • li • a, now available for pre-order and confirmed for release May 5 on Rise Records. Pitting spacey phaser and thrash-y riffing against a sidewinder hook and siren wail, “Incurably Innocent,” described by vocalist Cedric Bixler-Zavala as “a song about sexual abuse and being able to finally speak out,” reveals additional facets of the kaleidoscopic in • ter a • li • a (Latin for “among other things”). Produced by Omar Rodriguez-Lopez and Rich Costey at Hollywood’s Sound Factory, the 11-song 41-minute in • ter a • li • a picks up where 2000’s Relationship of Command left off… and rockets off into myriad other trajectories as unpredictable as they are intense. At The Drive In is Cedric Bixler-Zavala, Omar Rodriguez-Lopez, Paul Hinojos, Tony Hajjar and Keeley Davis. January 24th, 2017 (Burbank, CA) – Duran Duran has announced additional dates for their Spring 2017 World Tour, in support of their current album Paper Gods. 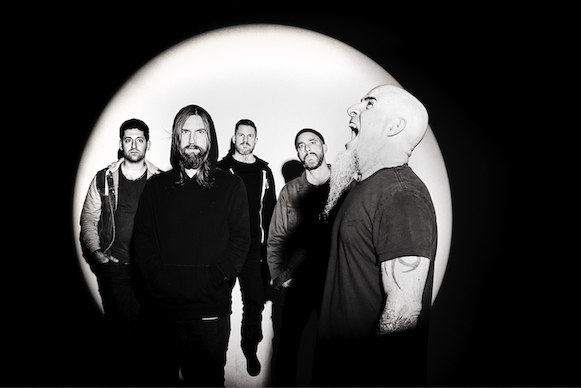 The new U.S. and South American dates include shows in Texas, Florida, Georgia and Belo Horizonte, Brazil. Tickets go on sale beginning Friday, January 27 at www.duranduran.com. Duran Duran VIP Fan Community members will have access to tickets before the general public. Members should login and visit the Presale page for details at http://www.duranduranmusic.com. Duran Duran rang in 2017 playing to a sold-out audience at the brand new Washington, DC-area venue The Theater at MGM National Harbor. As previously announced, the multi-platinum band will travel to South America to perform alongside additional superstar artists The Weeknd and Metallica at the Lollapalooza festivals in Brazil, Argentina, and Chile. 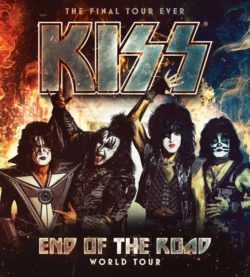 They will also play a headline show in Belo Horizonte, Brazil. These dates will mark the band’s first shows in this part of the world since 2012, and the very first in this market in support of Paper Gods. Tickets for Lollapalooza are on sale now, with info and links on www.duranduran.com. Paper Gods was released in September 2015 and entered the Billboard 200 chart at No. 10, earning the iconic British band their highest charting album in 22 years. Produced by Grammy Award-winners Nile Rodgers and Mark Ronson, along with Mr Hudson and Josh Blair, the band’s 14th studio album features collaborations with Janelle Monáe, John Frusciante, Kiesza, Jonas Bjerre (of Mew), and Lindsay Lohan. Duran Duran’s latest release is a very special, limited-edition, deluxe vinyl box set of Paper Gods featuring previously unreleased material from the album recording sessions and brand new remixes of the single “Last Night In The City.” Visit The Vinyl Factory’s website (http://thevinylfactory.com) for more details and purchase information. Duran Duran’s upcoming tour dates are as follows. Newly announced shows are in bold. Scare-A-Con – Horror & Sci-Fi Fan Convention Sets Dates for Central New York this Fall! Beware, horror fans: Famous names and faces from “The Exorcist,” “The Addams Family,” “Child’s Play” and “The Walking Dead” are coming to Central New York this fall. Scare-A-Con 2013 is set for September 12-15 at the Turning Stone Resort and Casino Event Center in Verona, N.Y. Previously known as Scare-A-Cuse and hosted in Syracuse, the growing horror and sci-fi convention relocated in 2012 and was officially renamed Scare-A-Con this year. The four-day event will also feature several reunions, including “Ghost Hunters” paranormal investigators Jason Hawes and Britt Griffith, “Mystery Science Theater 3000” funnymen Trace Beaulieu and Frank Conniff, “The Blair Witch Project” stars Heather Donahue and Michael C. Williams, and “Human Centipede” actresses Ashlynn Yennie and Ashley C. Williams. The 2013 convention also is launching the first-ever R.I.P. Awards for “Recognition of Inspired Performance,” and the creation of a Scare-A-Con Horror Hall of Fame. Fans will vote on annual nominees and awards will be presented during the event. For tickets and more information, visit www.scareacon.com. June 3, 2013 – The first batch of dates for the highly anticipated CARNIVAL OF MADNESS tour, powered by Monster Energy, have been announced. Sure to be known as the premier rock tour of 2013, the CARNIVAL OF MADNESS–sponsored by Monster Energy–returns this summer with multi-Platinum rock band SHINEDOWN, along with PAPA ROACH, SKILLET, IN THIS MOMENT, and WE AS HUMAN. The tour commences in Cleveland, OH on Tuesday, August 13. Go to www.CarnivalofMadness.com for specific on-sale date and ticket information, and see below for the first batch of shows. More will be announced in the coming weeks. VIP ticket pre-sales for these shows are now available to the “Shinedown Nation,” SHINEDOWN’s exclusive fan club. For more information about VIP pre-sale packages and “Shinedown Nation” membership, please visit the band’s official website, www.shinedown.com. Special Edition Of Underground Epic Will Include HD Transfer, VanBebber’s New GATOR GREEN Short & Other Exclusive Extras! LOS ANGELES, CA, February 21st, 2013 – Severin Films today announced the May 7th Blu-ray debut of Jim VanBebber’s legendary, award-winning indie THE MANSON FAMILY on the 10th anniversary of its original release. US theatrical dates in 20 major cities are scheduled through March and April and new poster artwork has been created by artist Stephen Romano for the occasion. VanBebber’s highly anticipated new short GATOR GREEN will accompany many of the screenings and will also be included in the extras-packed Special Edition Blu-Ray release. Severin Films was formed in 2006 with offices in Los Angeles and London. The company produced the acclaimed 2012 horror anthology THE THEATRE BIZARRE and their previous releases include Richard Stanley’s restored HARDWARE, the all-star War classic THE WILD GEESE, the unrated Director’s Cut of Just Jaeckin’s GWENDOLINE, Enzo Castellari’s original action classic INGLORIOUS BASTARDS, Oscar®-nominee Patrice Leconte’s THE HAIRDRESSER’S HUSBAND, the midnight movie sensation BIRDEMIC – SHOCK & TERROR, Eugenio Martin’s restored HORROR EXPRESS, and Alejandro Jodorowsky’s incomparable masterpiece SANTA SANGRE. Hollywood Undead have now announced even more new Spring tour dates in April with support from Falling In Reverse kicking off April 17th in Pharr, TX. Those run of dates will follow the March run with Dance Gavin Dance and Abandon All Ships. These dates follow the wrapping up the entirely sold out ‘Underground Tour’ this past January in support of Hollywood Undead’s newest album, Notes From The Underground, which is available on iTunes now. The album debuted at #2 on the Billboard Top 200, which is the highest debut to date for the band. 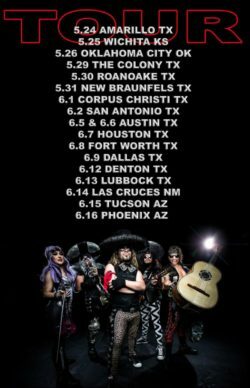 Make sure to check out the tour dates below to find out when the band will be in a city near you. For more information on Hollywood Undead including VIP package offers for the tour, make sure to check out their official website, as well as their Facebook and Twitter pages. Pick up a copy of Notes From The Underground available now.